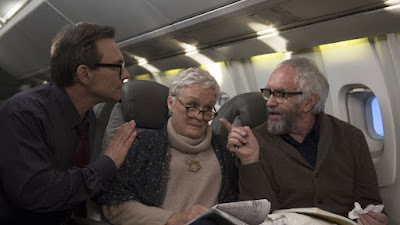 “The Wife” opens one morning with celebrated author Joe Castleman (Jonathan Pryce) taking a call at his Connecticut home from the Nobel Committee. But before receiving the expected, jubilant news, Joe asks if his wife (Glenn Close) can get on the other extension. She does, and as the Nobel Committee member explains that Joe has won the Nobel Prize for Literature, director Björn Runge cuts back and forth between Joe and Jean, husband and wife, as Joe bursts with false modesty and Joan seems to recede within herself. If these cuts come across pedestrian, they quietly evoke “The Wife’s” emergent question regarding the precise genesis of this literary goldmine, though it is reduced to a puzzle locking overtly into place rather than a peeling back of so many tantalizing psychological layers. 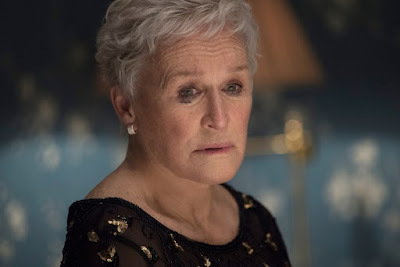 They also evoke the movie’s preference for the close-up, usually of Close, whose facial expressions frequently, brilliantly embody so many conflicting emotions that you half-suspect the narrative obviousness stemmed from a fear that the actor’s stellar poker face would leave her character’s motivation a secret for the ages. I should back up. “The Wife” does not quite begin with Joe getting a phone call from Stockholm. No, it begins with Joe worrying about whether he will get a call from Stockholm and, foreshadowing his gluttonous predilections, eating in bed, for which Joan scolds him. After winning, he and Joan hop up and down on the bed a la little kids before she climbs down and insists they get on with getting ready for a long day of ceremonial congratulations. She is, in other words, his caretaker, looking after him like a mother might look after a child, which Pryce plays straight to, evincing a distracted, irritable air even in his most composed moments, even if he is basically quoting his own performance in “Listen Up Philip.” Joe tramples over everyone, including his son David (Max Irons), a would-be writer who spends the whole movie dolefully trying to get notes on his latest story, less a character than the doleful trigger of a story bomb waiting to explode at just the right moment. All this suggests a domestic drama, with Joan in the role of long suffering wife, which is not my term but hers, telling Joe in no uncertain terms that she does not want to be thanked in his acceptance speech because she does not want to be viewed as a victim. It’s a cliché, sure, but one that Joan understands, and that the movie does too, deliberately raising it at the beginning to turn it on its head, remonstrating against the myth of the blustery male ego automatically equating to male genius, laying him bare as a vainglorious old white guy in moment when he pitifully trots out a James Joyce line to lure a comely photographer (Karin Franz Körlof). Rather, however, than confronting this myth head on, the movie comes at it through a mystery, one given rise by an unfortunately named author, Nathaniel Bone (Christian Slater). He essentially accosts Joe and Joan on their flight to Stockholm, an exquisite sequence in which, exhibiting the character’s comical disregard for personal space, he cuts the frame in half by pushing in so close to the married couple that he’s right in Joan’s face, prompting her to look anywhere but at him, Close’s scrunched lips practically exuding a “Can you believe this guy?” He is not so much interested in becoming Joe’s biographer, as Joe himself claims, as fishing for secret information on the Nobel winner, all of which will become evident when he takes Joan out for a drink in Stockholm. Though the eventual blow-out between Joan and Joe is solid, these cocktails between Joan and Bone is the best scene in the movie. If Bone, like David, is merely a device, he nevertheless becomes something more via Slater’s performance, a pitch-perfect piece of casting, wielding his Cheshire grin of a voice and a churlish, raised eyebrow grin to feign empathy as a means to try and get her to admit that she, not Joe, wrote all those lauded books. The camera’s proximity here feels like its own invasion of privacy, trying to get her to cough something up, which she both does and doesn’t, her entire air a revelatory tease as if she takes delight in reeling this preening sucker in and then shutting him down. The reality of this charge, meanwhile, is gradually laid out in flashbacks several decades earlier, showing how Joan and Joe met, the latter her literature instructor at a college. The movie might have command of the long-suffering wife cliché but has no such self-awareness when characters broach literary criticisms like heavy-handedness, as demonstrated by these flashbacks. They evoke a TV serial, not so much exposition dumps as thematically correlating so neatly to whatever present moment precipitates their recounting that they fail to work on their own dramatic level, just cookie crumbs on our way to a predetermined destination, rendered with such little flair that the supposed love affair between Joan and Joe plays like artifice rather than amour. Then again, as young Joan, Annie Starke, Close’s daughter, mirrors her mother’s emotional withholding. As labored as these past events are portrayed in answering the central mystery of Who Wrote It?, Why Did She Do It? never feels as cut and dried as you might assume. And Close takes that baton in the present to keep us at arm’s remove, teasing but never confessing, not even at the end, though I’d swear, in the wake of one last big fat deus ex machina, her smile seems to suggest she has been set free.